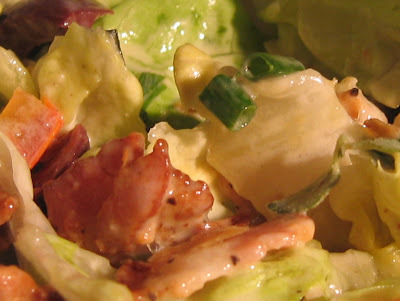 Another super simple salad, made with real basic ingredients. I was actually making mini BLT (Bacon, Lettuce, Tomato) biscuits the other day (Dave had to mix the biscuit dough for me as this was impossible with one hand in a cast! And yes, I actually did think I could accomplish it myself! Thats what happens when you're a perfectionist with high expectations!) This salad was made with all the leftovers from the sandwiches! 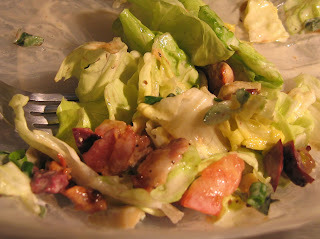 What better way is there to make a salad appealing than to add bacon to it!!? You could call it "Fat and Happy Salad." Toss with the smoky lemon dressing and serve with a biscuit or bread on the side. Mix all ingredients together using a whisk; if you need to thin it out slightly, add a tablespoon at a time of either buttermilk or water. This should make more than you need for the above ingredients, store any extra on the fridge for future salads or sandwiches.